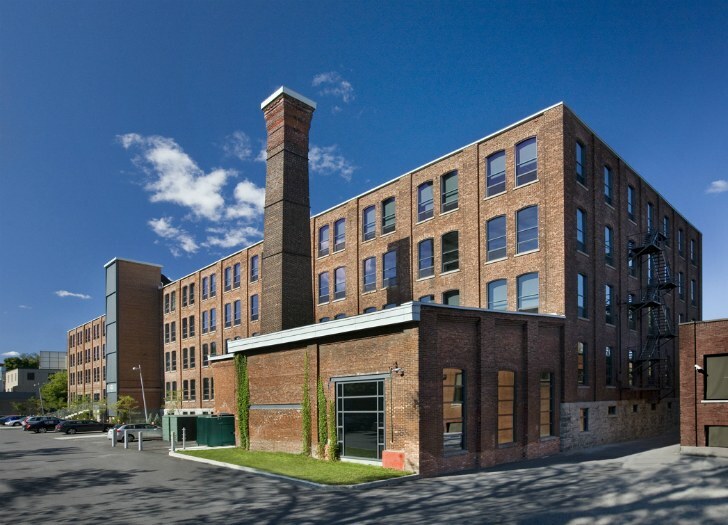 780 Brewster is a former five-story industrial factory in Montreal that has been transformed into a modern LEED Silver certified multi-tenant office building. Completed in 2007, the renovation upgraded the brick and timber building with larger windows to bring in more daylight, new energy-efficient mechanical systems, and 75% of the building's original structure was retained. The building now serves as the home of the City of Montréal’s Southwest Borough Hall and Lemay Associés, the architectural firm who was responsible for the renovation. The five-story converted factory now has a total surface area of 12,000 square meters, and 75% of the industrial heritage building’s structure (existing walls, floors and roofs) were reclaimed in the renovation. Lemay Associés fast-tracked the design and renovation of the structure and they were able to achieve LEED Silver certification for the existing building. The project added air conditioning and ventilation systems that are 50% more energy-efficient than standard new buildings. Larger, operable windows were installed to let in more light and allow for natural ventilation. The renovation also reused materials, like the metal plates and grillwork adorning the reception areas, to minimize waste. The project also included the use of recycled, recyclable, non-toxic and no VOC furnishings and finishes. A new bike storage facility and locker rooms allow employees to commute to work via bicycle, and a metro station and bus stop are located nearby, providing access to public transportation. Energy-efficient plumbing fixtures reduce water consumption by 30%, and the landscaping does not require any irrigation. Lemay Associés was awarded with a number of design awards for their work on 780 Brewster – including the Énergia Award for Existing Building from the Association Québécoise Pour la Maîtrise de L’énergie in 2009. This conversion and upgrading of the mill is a great example that even these industrial structures can be made efficient - even to the point of LEED silver status which is great. It would be interesting to find out why they chose LEED EBOM rather than LEED NC considering this project most likely would have fallen under major renovation. The five-story converted factory now has a total surface area of 12,000 square meters. 75% of the industrial heritage building’s structure (existing walls, floors et roofs) were reclaimed in the renovation. Lemay Associés fast-tracked the design and renovation of the structure and they were able to achieve LEED Silver certification for the existing building. The project added air conditioning and ventilation systems that are 50% more energy efficient than standard new buildings. Larger, operable windows were installed to let in more light and allow for natural ventilation. The renovation also reused materials, like the metal plates and grillwork adorning the reception areas, to minimize waste. The project also included the use of recycled, recyclable, non-toxic and no VOC furnishings and finishes. A new bike storage facility and locker rooms allow employees to commute to work via bicycle, and a metro station and bus stop are located nearby, providing access to public transportation. Energy-efficient plumbing fixtures reduce water consumption by 30%, and the landscaping does not require any irrigation. The offices of Lemay Associés. Lemay Associés was awarded with a number of design awards for their work on 780 Brewster - including the Énergia Award for Existing Building from the Association Québécoise Pour la Maîtrise de L’énergie in 2009. Larger windows allow more daylight into the open floor plan office space. Most of the building was largely left as it was, but improved with new equipment and eco friendly finishes.